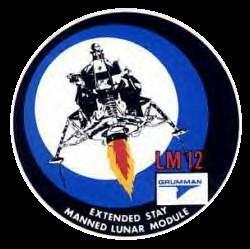 The Apollo LM was designed and built by the Grumman Aircraft Engineering Corporation. 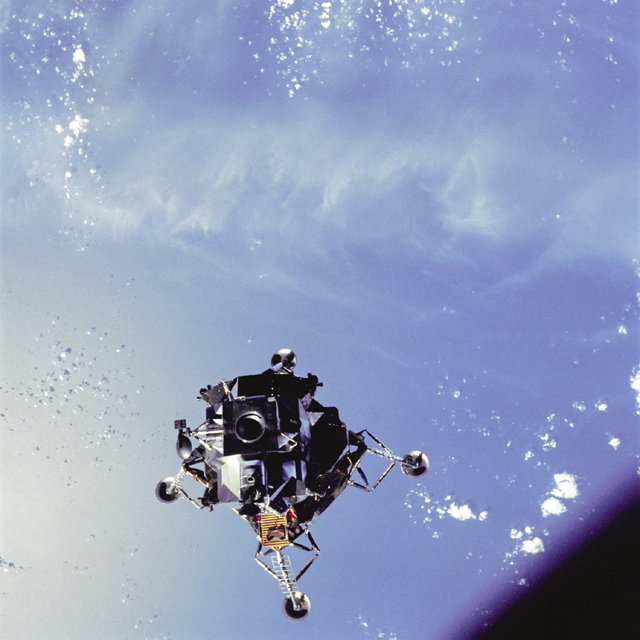 The LM is a two-stage vehicle consisting of an ascent stage and a descent stage. 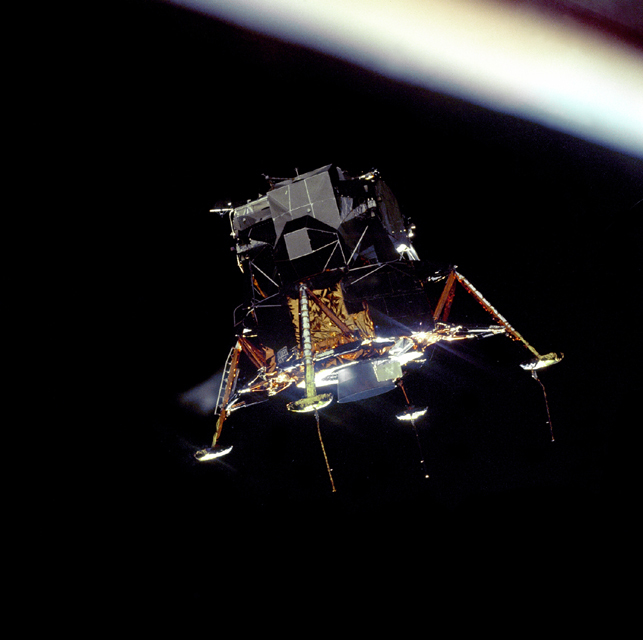 During descent to the lunar surface, both stages act as a single unit. 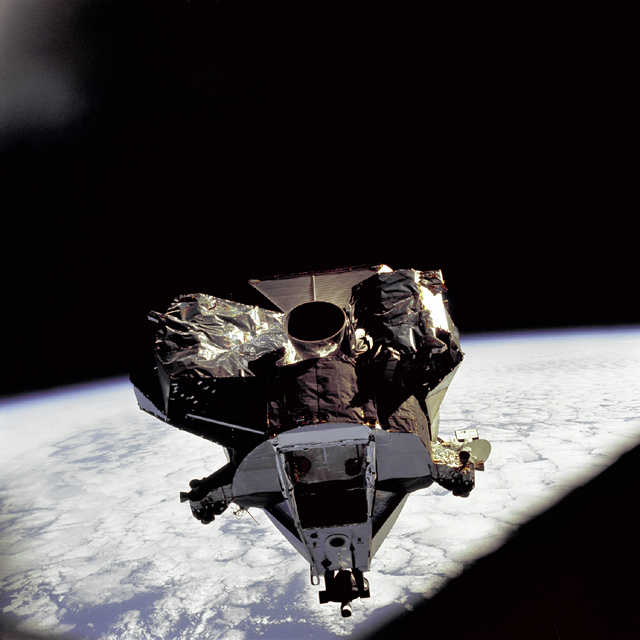 The ascent stage separates and functions independently during the ascent to lunar orbit, using the descent stage as a launching platform. 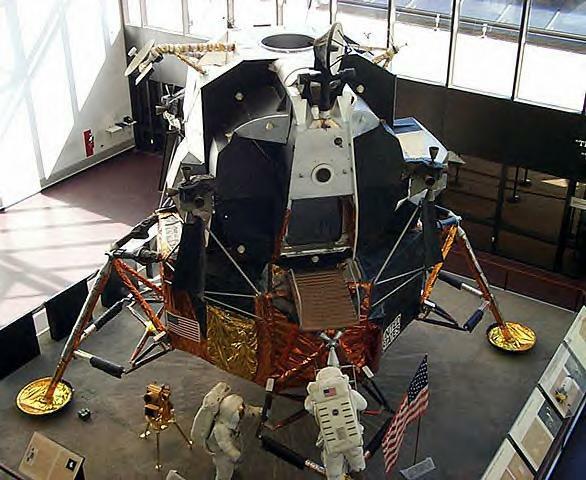 The LM stands over 22 ft tall, is over 14 ft across (or 31 ft across the landing gear, diagonally), and weighs 32,000 lb fully loaded on Earth (the later Apollo mission LM's weighted about 35,000 lb). The descent stage contains the components used to deorbit and land the LM, including the main engine, propellants, and landing gear. The descent stage engine is throttleable from approximately 1,000 to 10,000 lbs thrust. It is mounted in the center of the descent stage and is automatically gimbaled to align the thrust vector through the instantaneous center-of-mass of the LM. The descent engine uses UDMH (unsymmetrical dimethyl hydrazine) for fuel and nitrogen tetroxide for oxidizer. This is a hypergolic fuel/oxizizer combination, i.e. the two substances ignite on contact with each other without the need for an ignition device. The fuel and oxidizer are stored in four spherical fuel tanks. 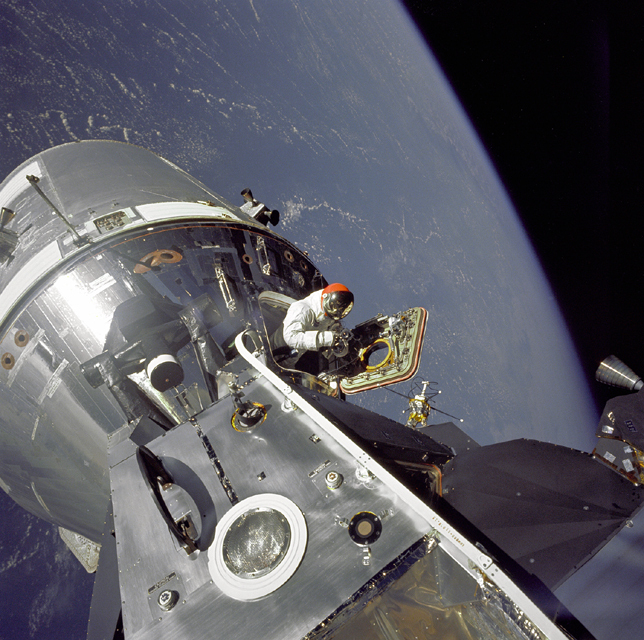 The propellant system is pressurized by helium gas stored in a fifth spherical tank. The landing gear are stored in a folded position in order to fit within the Saturn V shroud, and are extended prior to lunar descent. The ascent stage contains the crew compartment, an equipment bay, the ascent engine, the reaction control system, and the various components for instrumentation, guidance, navigation, control, life support, and communications. The reaction control system includes sixteen small thrusters (approximately 100 lb thrust) that provide attitude control in both the descent and ascent configurations. The ascent engine is a 3,500 lb thrust engine that uses the same fuel/oxidizer combination as the descent engine. 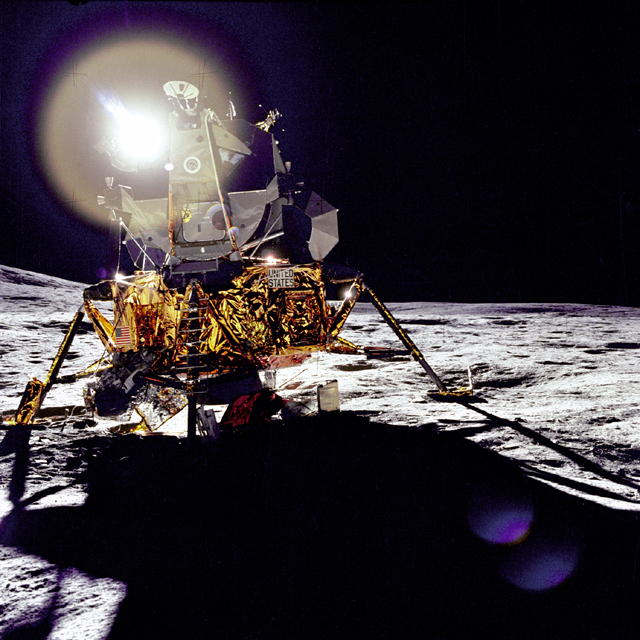 The LEM is no longer in use due to the cancellation of the Apollo program and the introduction of the space shuttle. 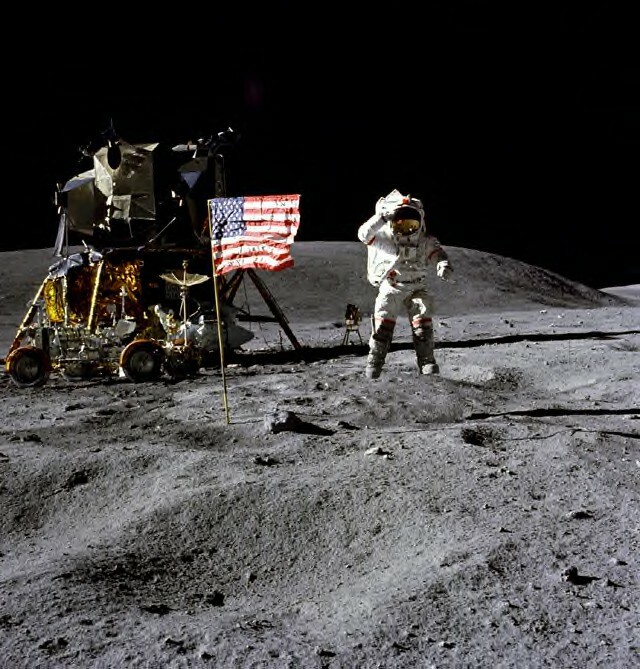 the last manned mission to the moon.